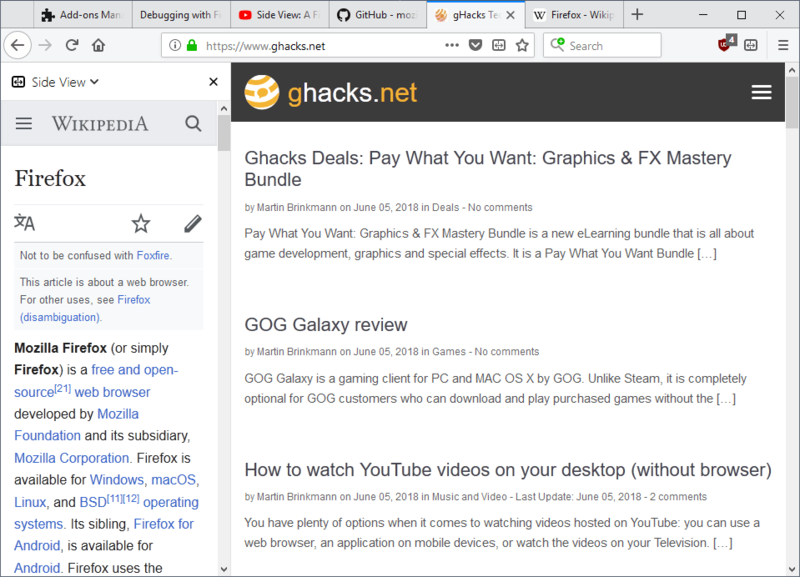 Side View is an upcoming Test Pilot project for the Firefox web browser that adds an option to Firefox to open any link or page in the browser's sidebar to display it side-by-side with another open webpage. Mozilla uses Test Pilot to test new ideas and features without having to integrate the functionality right away in the Firefox browser. The organization gathers data while the project is running and uses the data and user feedback to determine whether it is a good idea to implement a new feature in Firefox or release the feature as a standalone add-on instead. Side View is not an entirely new feature as it more or less an implementation of tab splitting browser extensions such as Tab Scissors for Chrome or Tile Tabs in Firefox (use Tile Tabs WE in Firefox 57+). The main difference between the two is that Side View loads a webpage in the sidebar of the Firefox browser. The Vivaldi web browser supports the feature natively. The Test Pilot add-on Side View adds an icon to Firefox's main toolbar when you install it in the browser. A click on it displays all open tabs, another click on any of the open sites opens it in the browser's sidebar. Firefox loads the mobile view, if available, for the site in question so that you won't run into display issues on most sites you open this way. The main benefit of using Side View is that you can display two webpages side-by-side in the browser without having to use two different Firefox windows for that. You could use it to play a video in the sidebar and do something else in the main browser pane, or display the WordPress dashboard and a source article next to each other. Side View supports a second option to load any site in the sidebar. You can right-click on links and select the "open link in sidebar" option to load it there. Check out the project's GitHub page to find out more about it. You find a signed add-on for download on the page as well in case you want to give it a try before the official Test Pilot project launch. Will Side View make it into the Firefox browser natively or will it remain an extension? My best guess is that it won't be integrated natively as most users of the browser probably won't require the functionality. Now You: What's your impression of Side View? Why not give us MDI? I like the idea, I used to use it a lot in Opera v12 (and still use it in Office 2010), but this is very limited. 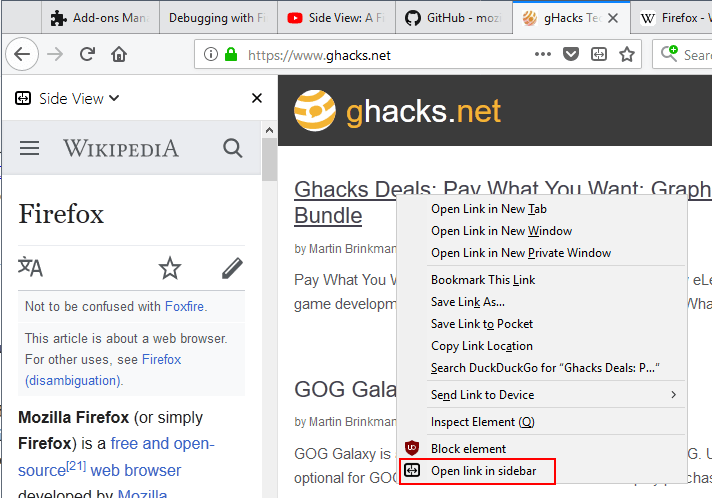 I miss Cool Iris Previews for Firefox that would put a little icon at the end of links (or elsewhere as could be set in the options) which would throw up the link in a window (that you can size and set as you wish) when the pointer touches it. I’ve tried it (before its latest update released May 30, 2018) and haven’t been really convinced, but some reviews on AMO are enthusiast. About ‘Side View’ : 50/50 excitation here. I mean, as much as the concept seems interesting (pro) as much I know I wouldn’t use it regularly myself (con). I’d prefer to see Firefox handle an in-content Library and a Library which would include links’ parent folders: that would be a progress on the ground of a browser’s fundamentals rather than juumping all around to innovate with questionable gadgets. Tom, Thanks for the link to ‘Simple Link Preview’. Been on constant watch for a replacement for Cool Previews and this is real close. Some tweaking needed but it’s off to a great start. I see it’s channeling CIP, same icon and elements, but no resizing and other options. Yet. I’ll keep it for a while to see how it goes. hope this stays an Addon and not integrated like pocket. Leave the people the choise, please. Why is that a benefit? Isn’t it better to run two instances side by side? Side View Pro: only one window, no window aligning, faster handling, e.g. minimizing, maybe, less memory use. Two windows: more control over window size, easier maximizing of one web page, both URLs visible all the time. This is a stupid waste of time. Mozzila should instead work on the proper interface for Tile Tabs and similar addons to have this function as before. This is a really interesting feature. I wish they implement this in Chrome. Side View has been in Firefox for a long time. Just add a bookmark to Bookmarks Bar, right-click on, select Properties and choose “Load this bookmark in the side bar”. Firefox is remains the best, but it’s funny how Mozilla goes in circles sometimes. Many years ago, a built-in feature would load a bookmark in the sidebar – you just had to check a box in bookmark properties. The right-click option is really neat. I’ve used an extension before to have a sidebar page view, but it was very clunky to load a page into the sidebar and essentially only useful to have the same page there the entire time. And there’s really not a whole lot of pages that I’d want always there. I’m using it and I’m really enjoying it! An other great experiment from Mozilla.